Linthwaite House Country House HotelLinthwaite House is the latest addition to the portfolio of Leeu Collection, the manifestation of founder Analjit Singh’s vision for sophisticated escapes and unique travel experiences. Leeu Collection’s hospitality portfolio currently comprises three five-star boutique properties in South Africa’s winelands: Leeu Estates, a 17-room country house retreat and boutique winery in the Franschhoek valley; Leeu House, an exclusive 12-room hotel in the heart of Franschhoek village; and Le Quartier Français, a romantic 32-room hotel including two independent villas also located in the village. 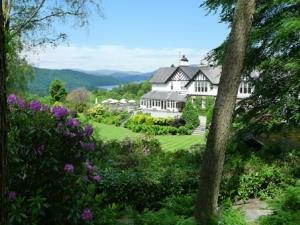 Located in the heart of England’s Lake District and set in 14 acres (5.7 hectares) of established gardens and well-maintained private woodlands, this luxurious 36-room boutique hotel is on a hilltop overlooking Lake Windermere and the perfect base from which to explore the scenic surroundings. There have been some notable changes in the well-manicured grounds, in addition to the construction of the Woodland Suites; 6 exquisite suites situated within our grounds adjacent to the picturesque tarn. To be completed in late Autumn is the newly-created raised wooden Windermere Deck, which stands next to Linthwaite’s tranquil private tarn (or small lake) and enjoys views to the north of Lake Windermere and the mountains beyond, providing a magical woodland setting in which to enjoy light meals and early evening drinks. In addition to the walking paths through the grounds as well as ample of guest areas to relax and unwind; guests might like to try their hand at a game of boules on the hotel’s well-maintained court or chess, making use of the hotel’s eye-catching giant outdoor chess board or using the hotel bicycles to explore the area. Linthwaite House sometimes limits bookings to 2 or more days. Our Classic rooms are an average size of 18m²/194ft². Located on the first floor with views over the gardens at the back of the hotel, these rooms have double beds, en-suite bathrooms with either a walk-in shower or a bath and shower overhead. Classic sometimes limits bookings to 2 or more days. Our Deluxe rooms are an average size of 36m²/388ft² and offer views of either the gardens or Lake Windermere. They all have king-size double beds and en suite bathrooms with underfloor heating and a bath and separate walk in shower. The Hot Tub Suite, our cosiest suite at 38m²/409ft², in addition to all the mod cons, also offer a private hot tub and views over our landscaped garden towards Windermere. Hot Tub Suite sometimes limits bookings to 2 or more days. Our Junior Suites consist of two spacious suites with an average size of 53m²/570ft², set in a secluded wooded area of the hotel grounds next to the Lake Suites, as well as the Loft Suite and Hot Tub Suite; both situated in the main hotel building. From Junction 36 M6, proceed eight miles (12.9 kilometres) along the dual carriageway towards The Lakes A591. At the large roundabout (just NW of Kendal), take the first left B5284/Crook Road turnoff, signposted ‘Hawkshead via Ferry’, and drive six miles (9.6 kilometres) to Windermere Golf Club on your left. Linthwaite House is on the left, one mile (1.6 kilometres) past the golf club. Take the Shap turnoff, drive the A6 to Kendal and follow the signs to Windermere. At the large roundabout (just NW of Kendal), take the B5284/Crook Road turnoff, signposted ‘Hawkshead via Ferry’, and drive six miles (9.6 kilometres) to Windermere Golf Club on your left. Linthwaite House is on the left, one mile (1.6 kilometres) past the golf club. My husband and I had a most relaxing rest in beautiful surroundings. All staff we met were not simply courteous but seemed to genuinely care that we had everything we needed. The food was amazing and I hope when we visit again, with the family hopefully, the same chef is still at Linthwaite House. Our thanks to you all.